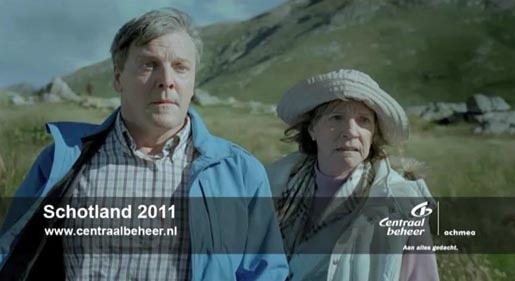 Dutch insurance company Centraal Beheer is running a new television commercial set in Scotland, promoting the brand’s car insurance deals. A couple driving by car through the Scottish Highlands have their tourism experience interrupted by a herd of sheep blocking the road. Attempts to move the sheep fail. As the couple gets out of the car they hear the voice of a shepherd in the distance. With the noise of the sheep, and the Gaelic language of the shepherd, they have no idea what he’s saying. As they reach the shepherd they are startled by a familiar sound. The ‘Schotland’ ad was developed at DDB Amsterdam by creatives Nils Taildeman and Menno Schipper. Filming was shot by Bart Timmer via Czar. Music was produced at MassiveMusic. No Mazda MX-5’s were harmed in the making of this advert.